Compare prices on car hire in Aberdeen Airport from all the major brands and find the best deals. When you book through us, unlimited mileage and insurance are always included in the price given. Aberdeen Airport (ABZ) is located about 10 miles from Aberdeen , and is the 2 largest airport in Scotland. 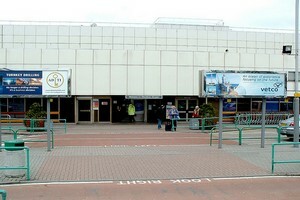 There are several buses between Aberdeen and the airport and a railway station is a short taxi ride from the airport. The offering car rentals, Avis, Enterprise, Europcar, Hertz, National and Alamo 3,290,920 passengers visited Aberdeen Airport in 2008. Half a million of these were passengers bound for the North Sea in connection with oil and gas industry. On average there are about 24 departures each day to London which is the most popular destination.Number two on the list is Amsterdam and Stavanger is the third most popular destination.Aberdeen Airport is served by 20 different airlines. The airport has a good selection of shops, cafes, bars and restaurants. Amenities include wireless Internet and ATM. There are several hotels nearby, one of them is the Aberdeen Airport Thistle Hotel which has a business center.